This is the quarterly magazine of which I am the editor for the City of Ballwin. It’s a project I helped implement in 2017, and we’ve received nothing but positive comments from our residents. People who live in Ballwin love it here. Genuinely. They want to know what’s happening. They support the staff. And they care. I don’t think most municipalities can say their residents truly care about what their local government is up to. But ours do. They like following our social media accounts. They went crazy when we introduced a bi-weekly e-newsletter. And they love blogs, videos, and events. Well I should rephrase that. They love Ballwin. It’s not that they love what we’re doing so much. It’s that they take immense pride in where they live, so it’s natural for them to react positively to anything we produce. But I digress. The Ballwin Life magazine issues to date are listed below. While I don’t have my byline written into this magazine, most of the content was written by yours truly and most of the photos are ones I’ve taken as well. Not only do I enjoy writing the articles, but I get to learn everything I’m writing about, and you all know how I feel about learning. It’s like air to me. One of the facilities I do marketing for with the City of Ballwin is our fitness center The Pointe at Ballwin Commons. A program I implemented awhile back is our Member of the Month feature. It’s exactly what it sounds like, and I love it because I get to meet the most inspiring, genuine, and hard working individuals. I’ve finally asked one of them if I could feature her story on my personal blog and she’s agreed. Next I need to reach out to the dozens of others and ask if it’s okay if I feature their stories. Only fear is holding me back from asking. But I’m learning to stare that down. Keep in mind all these stories are written from within the context of our fitness center and our patron’s experience at the facility. So while I tried to incorporate some of their personal lives, I was also careful not to share their entire life story to all the strangers at the gym. If anyone could be a professional motivator it would be this month’s Member of the Month Jamie De Geer. She is the epitome of dedication and inspiration. 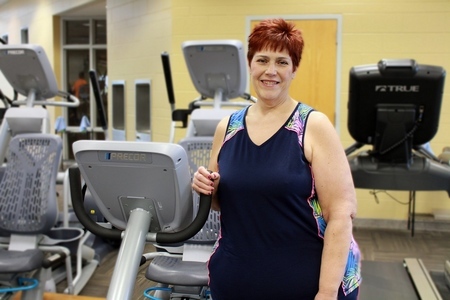 “About four years ago, I decided to take charge of my health and my life,” she said. At that time she had been trying to get healthy and lose weight for years, but she remembers it really clicking a few years ago. She resolved to come to The Pointe every day, and she did. Soon, she was on sabbatical and chose to come to The Pointe twice a day. A year into this new commitment, she had lost 130 pounds. To someone who’s struggling to get started, seeing Jamie’s results can be intimidating. But her powerful advice is to “start where you are.” If all you can do is 15 minutes on a bike, then do that. Slowly add five minutes, then another five minutes, and so on. “Take it one day at a time, one step at a time.” Having a place to work out close to home is an important part of following through with your intentions. If it’s a challenge to even get to the gym, it’s likely you won’t stick to your goals. Jamie knows this to be true and enjoys living close to The Pointe. “I will never move far away from this place, it was life saving for me,” she said. Jamie enjoys reading and going to plays, movies, and concerts with her husband Marcus who has been a great support and frequent exercise buddy. Together they have six children. “I really like in the evenings seeing families come here together. When I was growing up my family didn’t put an emphasis on exercise, so I grew up in an overweight family, and that’s just who I was. Even when I was raising my own kids, we didn’t make exercise important enough. So I really encourage families to get their kids here. It’s the only way to be healthy,” she said. Jamie has been the Director of Music Ministry at Good Shepherd Lutheran Church for 18 years. But who knows, maybe someday she will be a professional motivator. After spending just a few minutes with her, we’re certain you’ll see it’d be a natural fit for her. Congratulations on being named The Pointe’s Member of the Month, Jamie. Your daily dedication and goal for constant improvement is inspiring to say the least. Thank you for choosing The Pointe and willingly sharing your story which will surely impact many people. In case you didn’t already know, I also have a blog. Just click on the link above that says Blog and you’ll see more of my writing.